Note: The Canon EF 16-35mm f/2.8L II USM Lens has been replaced by the Canon EF 16-35mm f/2.8L III USM Lens. The Canon EF 16-35mm f/2.8L II USM Lens is what I consider one of the most important lenses in Canon's lineup. Taking over the ultra-wide angle position of the available professional grade f/2.8 zoom lenses from the Canon EF 16-35mm f/2.8L USM Lens, the 16-35 L II becomes the new standard for professional and serious amateur photographers alike. 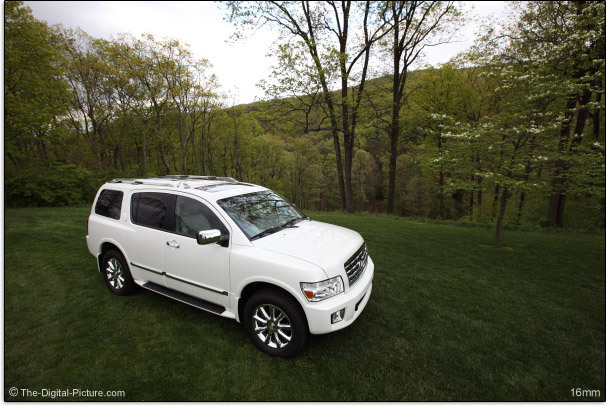 What does the 16-35mm focal length range look like on a full frame body? View a pair of comparisons below. If these angles of view look good to you, keep reading this review. I mentioned "professional grade" - This is a very high quality, solidly-constructed lens worthy of its L Series designation. The Canon EF 16-35mm f/2.8L II USM Lens measures 3.5" x 4.4" (88.5mm x 111.6mm) and weighs 1.4 lb (640g). This is a very nice size and weight for comfortable, sure handling - the build quality makes it a joy to use. The large 82mm filter size is a first for Canon EF Lenses. High quality filters of this size are expensive and at this point, not shareable on other Canon lenses without a stepping ring. The larger objective end of the barrel reduces the handling comfort of this lens only slightly, but the improved image quality is definitely worth the change. Focus and zoom rings are well-positioned, nicely sized, smooth and well-damped. Of course, the high filter cost can be avoided by simply not buying a filter. But, the 16-35 L II is fully weather sealed to protect against dust and moisture only when a filter (typically a UV Filter) is in place like all of the other current-at-this-time sealed non-super telephoto lenses). Even though the extending inside portion of the lens barrel is gasketed, This filter is necessary to fully seal the lens. The lens does not change in overall size, but the inner barrel extends to its maximum near 28mm from its minimum at 16mm. A filter completely encloses this movement - and does not rotate. Mouse over the pic below to see the limits of movement. Unfortunately, a normal thickness UV filter causes some additional vignetting at 16mm when mounted on a full frame body. This can be seen using the mouseover feature in the lens vignetting comparison. So, the B+W 82mm MRC Slim UV Filter is going to be the best full frame option in my opinion. Users of 1.3x and 1.6x crop bodies will be fine with the normal thickness B+W 82mm MRC UV Filter. While most Canon L Lenses have 8-blade diaphragms, the ultra-wide L zooms including the Canon EF 17-40 L Lens, Canon EF 16-35 L Lens and Canon EF 16-35 L II Lens diaphragms contain only 7 blades. The circular shape of the 16-35 L II's blades help create desirable round-shaped OOF (Out Of Focus) highlights and an attractive background blur. Of course, a lens this wide is not the best for creating a blurred background. The constant f/2.8 maximum aperture is very nice - as fast as any Canon zoom lens made at this time. Variable max-aperture lenses add a changing parameter to accommodate when shooting wide open. With a constant f/2.8 max-aperture lens, wide open exposures can remain the same over the full focal length range. And I am just talking about max apertures here as all lenses can be stopped down - to f/22 with the 16-35 L II. Canon's rear-focusing Ring USM is excellent - fast, silent and accurate. The Canon EF 16-35mm f/2.8L II USM Lens utilizes the latest auto focus algorithms - though I imagine all new lenses do when they are introduced. I tend to shoot a lot of extra frames when I'm using a new, yet-untrusted lens for shots I care about. Overshooting has proven unnecessary with this lens as I am getting excellent results - accurately focused. The 16-35 L II has FTM (Full Time Manual) focusing enabled. Shown above are the Canon EF 17-40mm f/4L USM Lens, Canon EF 16-35mm f/2.8L USM Lens, Canon EF 16-35mm f/2.8L II USM Lens and Canon EF 24-70mm f/2.8L USM Lens. I'm very pleased with the image quality I'm getting from this lens. Wide open results are very sharp in the center and improve only slightly stopped down. Wide angle full frame corners, though not perfect, are very good for a lens this wide - the best full-frame Canon wide angle zoom lens yet. Flare is not absent, but it is very well controlled for an ultra-wide angle lens. Colors and contrast are very good. Exposures are 1/3+ stop bright compared to what I normally expect - the camera meters this way with this lens (same as with the 16-35 L I). CA (Chromatic Aberration) is well controlled but present in the corners - especially at 16mm. Full frame users should expect vignetting in the corners at 16mm and f/2.8 and even 1.6x FOVCF body users will notice a more even darkening at 35mm. Longer focal lengths show only a small amount of vignetting - again only noticeable with a full-frame body. Some barrel distortion is present at the wide end that - as usual - is most obvious when straight lines are near the frame borders. Distortion is negligible from 20mm through 30mm where slight pincushion distortion becomes present. Although it has proven extremely time consuming, I completely evaluated two copies of this lens - purchased from two different retailers. This included shooting the ISO 12233 chart test with both lenses - with the intent of allowing either to be selected for evaluation with the online tool. In the end, the ISO test results were so similar that it did not warrant making both sets of results available. The lenses were nearly identically sharp in the center. Lens 1 was slightly sharper to the left at 16mm while lens 2 was slightly sharper to the right (slightly more centered). The two reversed side preferences at 24mm and were the same at 35mm. I want to emphasize that these differences were very slight - I would be very happy with either lens. With an MFD (Minimum Focus Distance) of 0.92' (0.28m), the 16-35 L II has a MM (Maximum Magnification) of .22x (at 35mm of course). This is a decent middle-of-the-road magnification value. However, with the wide focal lengths delivering these reasonable values, a unique wide/close perspective with a less-blurred background can be achieved. To increase MM, add an Extension Tube. A 12mm extension tube increases MM to .62x and a 25mm extension tube delivers up to 1.11x (both figures are at 35mm - extension tubes are not compatible at the wide end of the focal length range on this lens). This lens is not compatible with Canon's 1.4x and 2.0x Extenders. The Canon EF 16-35mm f/2.8L II USM Lens reports distance information to the camera - this information is especially helpful to flash exposure calculation. If you are shooting a full-frame body, you will want to use the pull-out, flip-down diffuser on your Speedlite for direct flash work at the wider focal lengths. As shown above right, the 16-35 L II ships with a very wide (and not very protective) Canon EW-88 lens hood. The Canon 17-40 L is on the left and the 16-35 L I is in the center. A Canon LP1319 soft lens pouch is also included. "Canon's engineers have completely redesigned the optics on the EF 16-35mm f/2.8L II USM to deliver higher contrast levels and improved resolving power." [Canon's Press Release] Of course, they are referring to a redesigning of the Canon EF 16-35mm f/2.8L USM Lens - a very good and very popular lens itself. The biggest physical appearance change is in the II's wider lens barrel at the objective end - going from 77mm to 82mm in filter size. The 16-35 L II is .2" (5mm) wider (for the just-noted reason), .3" (8.6mm) longer and weighs the same as the original 16-35 L. They feel identical out to and including the focus ring. The II's zoom ring is more firm (I like this better). Minimum focus distance remains the same - Maximum magnification remains the same as well. Barrel distortion is noticeably reduced at the wide end while pincushion distortion is slightly increased at 35mm. Flare is reduced over the entire focal length range - improving contrast in some comparisons. Overall, I consider the 16-35 L II sharper than the 16-35 L I, but this amount of difference varies throughout the focal length range and distance/direction from the center of the image. The II is at least as sharp or sharper in the center of the image at all focal lengths. The II is especially improved in f/2.8 non-center sharpness on the wide end. For the most part, I would consider the II an improvement in non-center sharpness overall though the 16-35 L I holds its own or even surpasses the II at certain focal lengths/apertures/points within the frame. The II has slightly less vignetting than the I. CA is very slightly reduced - but looks different as it is primarily present in the corners which are now sharper at many focal lengths and points within the frame. Both lenses deliver exposures about 1/3+ stop brighter than usual. Another very good Canon ultra-wide angle zoom lens is the Canon EF 17-40 L Lens. Costing far less money, the 17-40 L rivals the image quality of the Canon EF 16-35mm f/2.8L II USM Lens. It is a great value and I frequently recommend it. The biggest difference between these two lenses is the complete stop aperture advantage the 16-35 L II has - It can stop motion (subject or camera) in 1/2 the light required by the 17-40 to do the same. The f/2.8 aperture makes the 16-35 L II a much better low light/indoor available light lens. Physically, the 17-40 is smaller - .6" (17mm) shorter and .2" (5mm) narrower (once again, the primary difference is the objective end size) and is lighter by 3.2 oz (100g). The focal length range is a notable difference - the 17-40 gives up 1mm on the wide end for an extra 5mm on the long end. The difference on both ends is noticeable - and the 17-40 is longer at 35mm than the 16-35 II is at 35mm. One advantage the 16-35 II has over the 17-40 is better vignetting performance - though full frame body users will see the most significant difference. The 17-40 meters exposures 1/3 stop darker than the 16-35 II. Even with both lenses wide open (f/2.8 vs. f.4), the 16-35 II shows less light fall-off than the 17-40. I find the Canon EF 16-35mm f/2.8L II USM Lens to be at least slightly sharper in the center at all apertures (including f/2.8 vs. f/4) and focal lengths. At 35mm, they are very similar. Because the 17-40 corners are darker at comparison apertures wider than f/5.6, care must be taken to differentiate between differences in corner sharpness vs differences in vignetting. 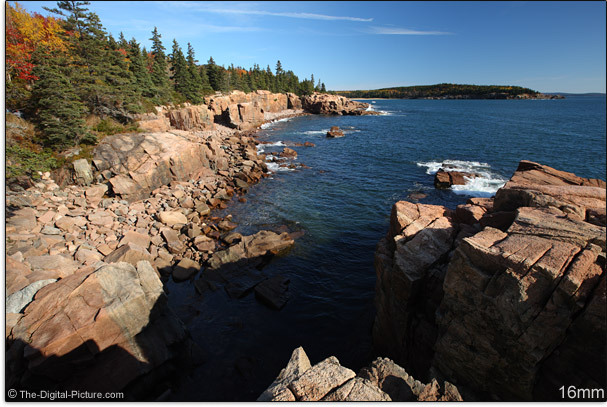 At 16/17mm, the corner sharpness results were mixed with both lenses showing better results at various areas of the frame in various comparisons - the 16-35 is slightly better for a generalization. At 24mm, the 16-35 II wins the corner matchups and at 35mm they are mostly similar with the 17-40 having an slight edge - especially with close subjects (such as the ISO 12233 Chart). Flare is handled just slightly better by the 17-40, while the 16-35 II has less corner CA. The 17-40 L has a bit less barrel distortion at 17mm than the 16-35mm L II has at 16mm but the 16-35 has less at 20mm. The 16-35 has slightly more pincushion distortion at 35mm. If you are shooting wide landscapes with narrow apertures, the Canon EF 17-40mm f/4L USM Lens will save you a lot of money as both lenses are sharp corner-to-corner at f/11. If you are shooting at wider apertures on a full frame body, the Canon EF 16-35mm f/2.8L II USM Lens will definitely be worth the upgrade. If you want the best of these lenses, the 16-35 L II is it. 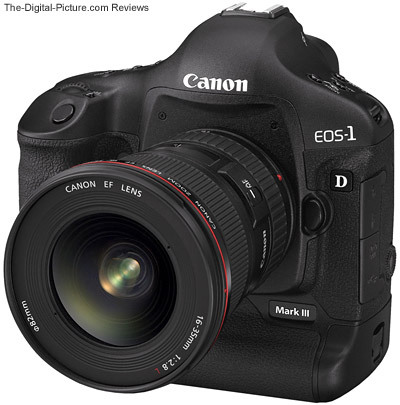 Be sure to read the Canon EF 14mm f/2.8L II USM Lens Review. 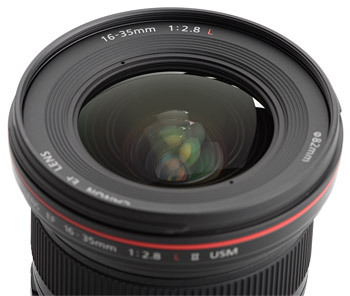 Users of 1.6x FOVCF bodies may also want to consider the Canon EF-S 17-55mm f/2.8 IS USM Lens. The 17-55 adds Image Stabilization and a significantly longer focal length range to what the 16-35 features - though it is 1mm longer on the wide end. The 17-55 is sharper in the corners but is noticeably more susceptible to flare and shows some vignetting on 1.6x bodies. The 16-35 is full-frame capable, better-built and weather sealed. Although 16-35mm is not a wide focal length range, it is an essential range for many situations. Let's review another set of 16-35mm focal length range examples. This set of examples also shows perspective change. The first row of mouseover links above will show you the 16-35mm angle of view as seen by a Canon EOS 5D Mark II from a stationary position. Rows 2 and 3 show perspective change - the subject distance is changed to retain similar framing of the SUV at each focal length. While not scientifically precise, the examples show how objects closer to the lens appear much larger than those several times farther away. Since wide angle lenses emphasize the closest in-focus objects in the frame, you will want to keep the noses of those you care about at a distance. We don't typically look at people from really close distances. And when we look at photos of people from these distances, certain body parts start looking funny. Get the telephoto lens out for your tight portraits. This lens does however make a great full-body and environmental portrait lens. It works well for small to large group pictures. Or, move in close for that unique perspective. Unique portrait perspectives can be fun, but don't overuse them as they get old fast. A wide aperture, wide focal lengths and excellent wide open optical performance combined with an excellent AF system make this lens especially versatile. The Canon EF 16-35mm f/2.8L II USM Lens is perfect for the wide work at a wedding and for other photojournalism needs. It is excellently suited for indoor events such as stage work and parties. Want to capture a wide landscape? Perfect (well, nearly so as the perfect landscape lens does not exist). Use wide angles to emphasize a close subject against an attractive (and mostly in-focus) background or simply take in a wide expanse of beauty. Architecture and real estate photography often have large subjects that require wide angle lenses. Working in a tight space? The 16-35 L II may be your lens. Use it for shooting in an airplane cockpit, the passenger's seat of a car, inside of a large product ... Going underwater? The 16-35mm focal length is a great choice for down there, allowing framing of your subject from a close distance, minimizing the image degradation caused by water clarity issues. The Canon EF 16-35mm f/2.8L USM Lens could also make a reasonable walk-around lens if your needs are typically for a wide angle lens - especially on a 1.6x FOVCF body. The short focal length range limits this lens' usefulness as a 1-lens-does-it-all general purpose lens. But, this lens performs excellently as part of a kit. 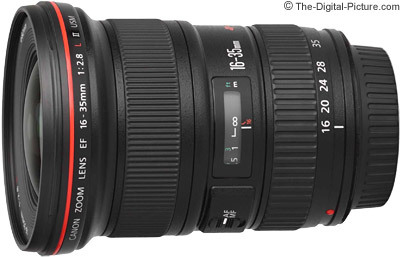 The Canon EF 16-35mm f/2.8L II USM Lens - not inexpensive, but highly recommended. Note that since this review was published, two amazing new Canon 16-35mm L Lens models have been introduced and warrant consideration. 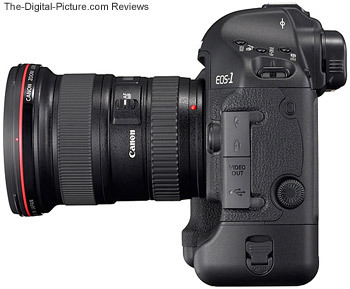 They are the EF 16-35mm f/2.8L III USM and EF 16-35mm f/4L IS USM Lenses. Both offer a huge upgrade in image quality and the latter offers image stabilization at the sacrifice of one stop of max aperture.